In a few short days, I’ll have another birthday. As is the case for most my age, birthdays are arriving faster and faster each year, but that’s not the only way mine have changed. A year and a half ago, I lost my mother, as many of you already know. It was a traumatic loss due to a massive stroke, and there are times to this day that I think I must be dreaming. She can’t really be gone. I miss her every day, but special occasions exacerbate the longing. My mother had mastered special occasions, pulling out all the stops on making those she loved feel special. I hadn’t been home for a birthday in years – having moved away in 1991 – but we did share some together. Both parents flew to celebrate with me when I turned forty, and I went to them for fifty. Otherwise, having a birthday so close to Christmas made it too challenging from a job perspective to be home for both. What would she do to compensate for my distance? She’d send a whole box full of gifts. Little things, mostly, since Christmas was our real time to splurge. In later years she found this more challenging, stating that I’d gotten hard to buy for, because I didn’t need anything. But I knew it was because she’d exhausted herself making Christmas perfect and just couldn’t put in the same amount of effort. I didn’t care. It wasn’t what was in the gifts so much as simply getting them. 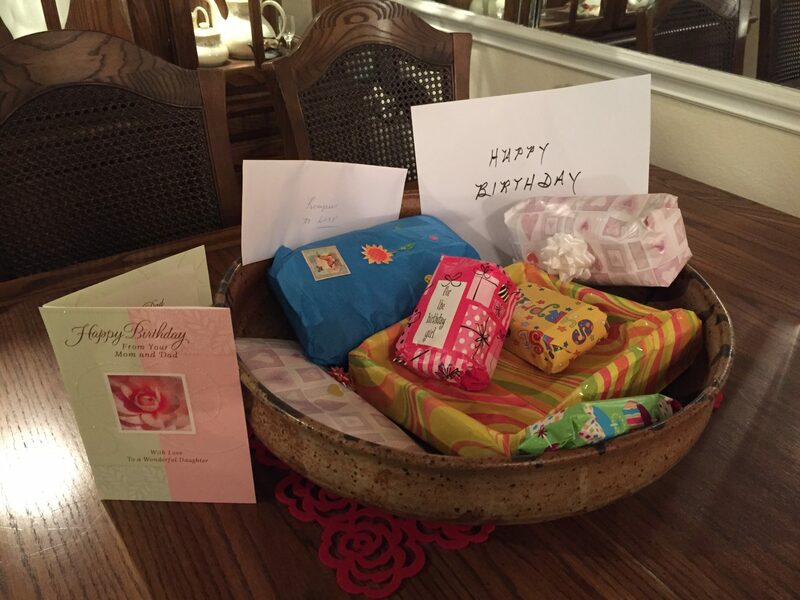 Every birthday, I’d open those gifts with mom and dad on the phone – each on an extension. In the last few years of mom’s life, we’d Skype, so that they could watch, while I unwrapped each one and squealed with delight – and I did squeal with delight, knowing that it would bring her joy. My gifts always arrived early by a week or two, so that I could “enjoy them.” I’d put them in the big ceramic bowl on my dining room table and send her a picture. And I did enjoy them. They always looked so beautiful with their strategically placed stickers and bows, all the while calling my name and tempting me to open them before the day. I never did. My ceramic bowl sits empty now, although I do have a great deal of love in my life, and I do receive gifts. There was just something about getting them from mom that I never took for granted. I knew that someday they’d stop coming – those cherished boxes – and I knew my heart would ache. I still have my dad, who has become the best-damned card shopper in North America. He picks out the most special (and surprisingly sentimental) card on the shelf and writes something loving inside that brings a tear to my eye. When I receive them, I write the date on the back with plans of keeping them forever. I also hug the card and cherish the moment, knowing that my mantel will someday be empty, too. I will celebrate my birthday this year (and every year), and I will feel loved. In the process of redefining tradition, however, melancholy can be a tough thing to avoid. I think taking time to cherish what still is before it’s gone is the most important thing we can do in honoring our loved ones. I fill my imaginary birthday box with memories now, and I give myself plenty of time to enjoy each one. You had a very social Mom and you have an equally special Dad. One of the many things one should take away from reading this post is to cherish what you have so that when it is no longer there you have those special memories to fill the space! Thanks, so much, Kathy. I really appreciate you writing that reply. She truly was “very special.” Hugs! Leana, this is so sweet and so true. What a lovely way to pay tribute to your Mom. Wow. You crossed my mind on my drive home today, and then I opened my laptop to find this note. Has it really been nine years? I still don’t know how you all got through losing both parents so close together. I love you always, too, my friend. Always and always. Sending hugs! What a special lady your mother has to be to raise such a lovely lady as you! Happy Birthday! For whatever reasons there were not many birthday “celebrations” in our family. (maybe it was related to the national depression that financially depressed many of our families). (I’m old, you have to realize)… We usually had a birthday cake and one present and I only remember one party, so to this day I have a very difficult time remembering peoples’ birthdays. To this day I keep asking myself “Why did I forgot ‘so and so’s’ birthday”? I guess you always have to cherish it in order to remember it? !